Jaimie managed to juggle her full-time student duties at McMaster University, juggling her final exams around the trip. Jaimie, and her 12-year-old Westphalian mare, Fleurina (Florestan x Nouveau Roi) won all the Young Rider tests at the Gold Coast Opener held in West Palm Beach, FL, on January 21-24, 2010, and at CDI-W/Y/J/P Wellington Classic Dressage Spring Challenge held February 12-14, 2010. 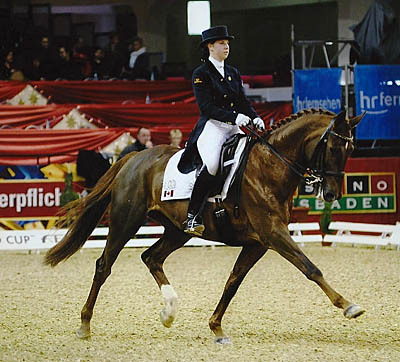 In the Young Rider dressage competition at the 2010 North American Junior and Young Rider Championships, held July 28 to August 1st in Lexington, KY, the pair won gold in the Freestyle test, bronze in the Individual test and the overall team silver medal. Jaimie and Fleurina earned a fifth place finish, with a score of 64.800%, in the Freestyle Consolation Finals. The pair also finished ninth in the Individual Test which was a qualifier for the Freestyle Finals.